The landscape in Viksjö is dominated by the Mjällån valley, a crevice valley from south to north, created at a volcanic eruption at the island of Alnö millions of years ago. The valley contains immense layers of sediment from the melt-away phase of the glacial period about 8000 years ago. At that time a great river of melted ice water had its outflow in the bay at the entrance to the valley. For many centuries the outflow of the river was located where Hornsjön is today, and a wide delta was created. The small tarns in the area are cavities created when gigantic blocks of ice embedded in sediments melted. In Hornsjömon there are also dunes, caused by the wind's remoulding of the delta sand after the Ice Age. During the melt away phase of the Ice Age, mountains were like islands in an archipelago. 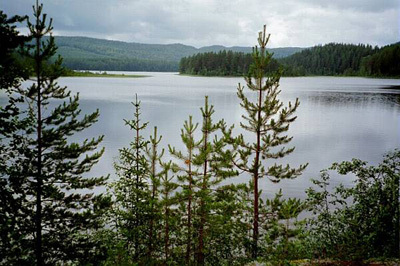 After the Ice Age the Mjällån shaped the valley, with ravines and steep sandy riverbanks. 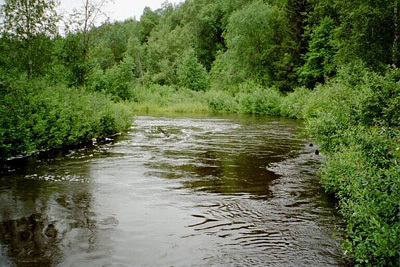 A beautiful steep riverbank can be seen just north of where the Mjällån and Viksjöån join, south of the village church. The valley lies between the district´s highest peaks, which are more than 400 meters high. The Mjällån valley has an interesting flora. Unusual plants like almond willow grow along the riverbanks, and in ravines just south of Käckelbäcksmon you can find rare grasses. Several of the sun warmed mountain sides along the valley are special, and Bastusjöberget accomodates, for example, plants that grow in only five other places in Sweden. On the southern slope of Billberget you can find mountain violet. This flower is also called Viola Collina, and doesn't grow any further north than this. Around Viksjö there are many beavers. Bears and lynx also wander through, and sometimes even a lone wolf.